I drove fast with the top down through northern Pennsylvania's "Endless Mountains," the wind drowning out the sound of the Fiat's turbocharged engine. It was the most beautiful part of a long drive to meet four of my brothers. Together, we weren't quite half my parents' offspring. There are 11 in total. One of my brothers wouldn't be there and neither would any of my five sisters. But the car contingent would be represented. I was coming in from New York City in a brand new 2017 Fiat (FCAM) Spider. My eldest brother, Andy, was coming up from rural Pennsylvania in his red 1964 Porsche 356. Carlos was driving all the way from Virginia in his 1960 Triumph TR3. 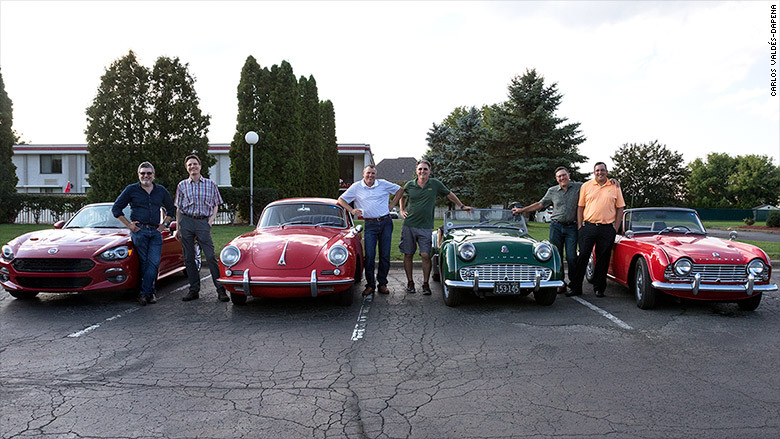 Mark, with his son Jon as co-pilot, was driving in from Toledo in his 1964 Triumph TR4. My brother Dan was coming, too. 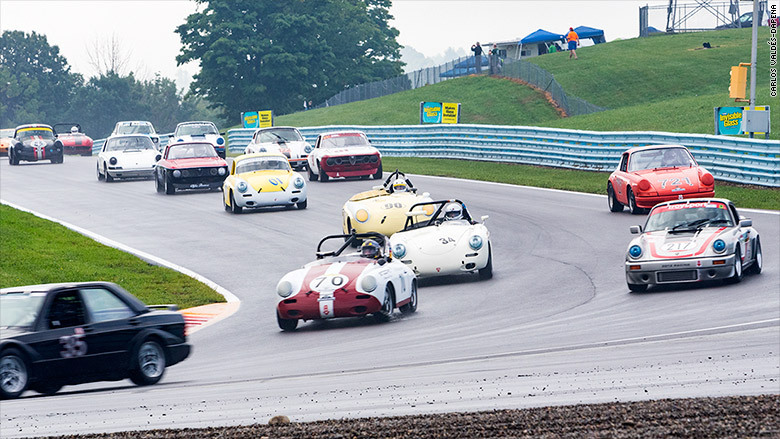 He never cared much about cars, but he caught a ride up with the others just to be with us for the annual Watkins Glen classic car weekend. Once we were together, another man appeared. To me, at least. He was in our conversations off and on for three days, especially at night when we sat and shared drinks in a hotel room. There was a lot wrong with the man, but my father, who died almost 25 years ago, was the reason any of us were involved in cars. He learned to drive in the lap of a chauffeur on his family's estate in Cuba. He moved to Philadelphia after graduating from medical school in Havana in the early 1940s. There he met my mother who had also just earned her medical degree. After they married, Dad spent much of their money on his hobby, racing Porsches. 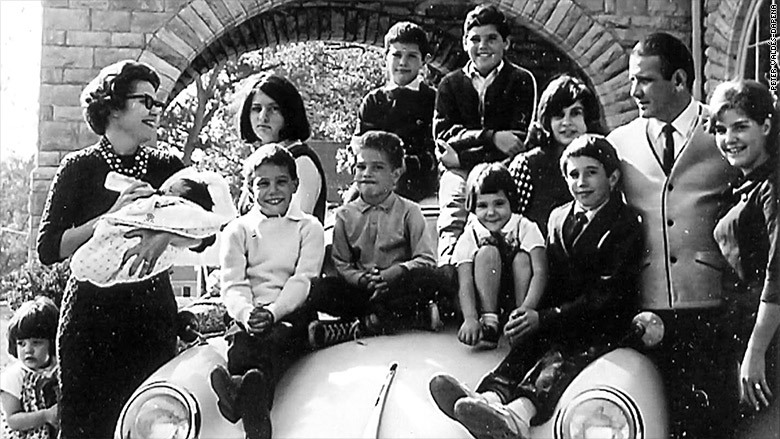 The author, taking a bottle, with his family in 1964. He was an arrogant man, but well-educated and cultured, speaking several languages with the fluency of a native. He didn't order vodka. He asked for "wood-kah." He expected others, women most of all, to see to his needs and comforts. My mother earned renown for her work studying Sudden Infant Death Syndrome, but she also mixed my father's cocktails, served him breakfast in bed each morning and was his "pit crew" on weekends, often while pregnant. I hadn't left the womb yet when my father's racing days ended with a near-fatal crash at New Jersey's Vineland race track. Unlike Andy, I never got to watch him compete in person. I grew up eyeing his racing trophies -- mostly small ones from hill climb events -- watching flickering home movies of races and sitting in the cramped backseats of his sports cars, smelling his hair oil and watching him drive. The fact that my father had raced fascinated me. 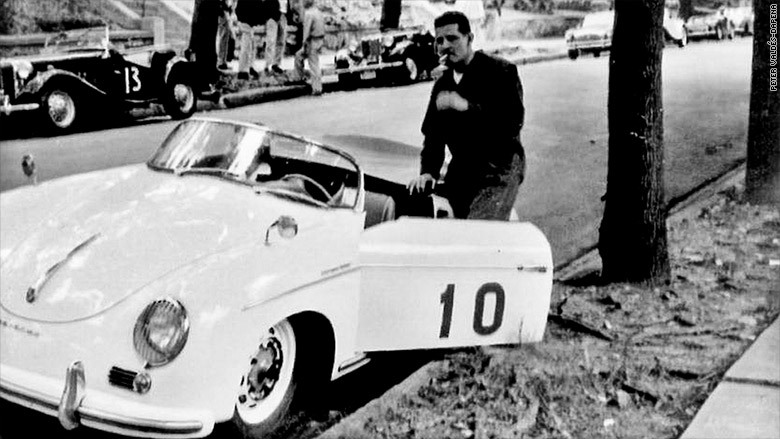 The author's father with his Porsche 356 Speedster before a hill climb race in the early 1960s. He largely dismissed me until I started writing for my high school newspaper. He always wished he had become a writer, he told me. When he thought his youngest son might actually become a journalist, he suddenly took an interest in me. I was a teenager so, naturally, I resented this and pursued other interests. But in the years after he died, the life of a reporter pulled me back. So there I was, in the fall of 2016, a man who writes about cars for a living, standing at one of the world's most famous race tracks surrounded by four of his other sons. My father would have loved it. I rarely miss him, but I did that day as we watched cars like his race through the turns at Watkins Glen International. They were driving harder than you'd think cars that age would have any right to. The six of us, my brothers and my nephew, spent hours watching under the hot sun, our ears hurting from the noise. Again that night, we went back to our hotel, drank good liquor, told jokes I'll never repeat and shared a story or two about our father's bad behavior and some about our own. And we talked about cars. I've had a lot of weekends in a lot of places but it's hard to remember a better one.